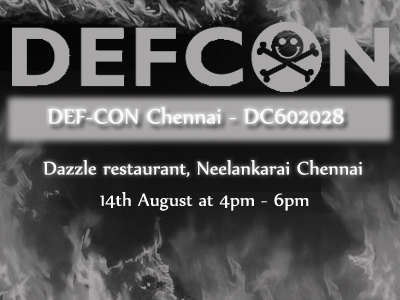 DEFCON Chennai (DC602028) inviting all the like minded heads for the August 2011 meet In Chennai. Get Ready for Next Generation DefCon Meet..
-Where it 's taking place? -Who will be the speaker ? There is no speaker, really. We dont have any speakers. It's going to be a Hacker meet, so we want each and everyone among us to share their little adventure. In other words "All are Speakers". -What are we going to talk about? Literally about everything on the "Hack Field". PS: We will be discussing about Exploits and Narcissism. - Will I get a Free foods, Drinks and hukka? - How can I contact DEF-CON Chennai? -Will the meet get canceled? No, the meet will not get canceled. If it happens we will mail about it or call you about it.